An old fashioned, heirloom Southern recipe for classic red velvet cake and the original cooked flour buttercream frosting. We went over to Mama and Daddy’s for supper yesterday and when I walked through to door there sat the layers for a red velvet cake cooling on racks. Mama was already cooking ribs, greasy rice and sweet potatoes and now there’s going to be red velvet cake too?? Praise the Lord! 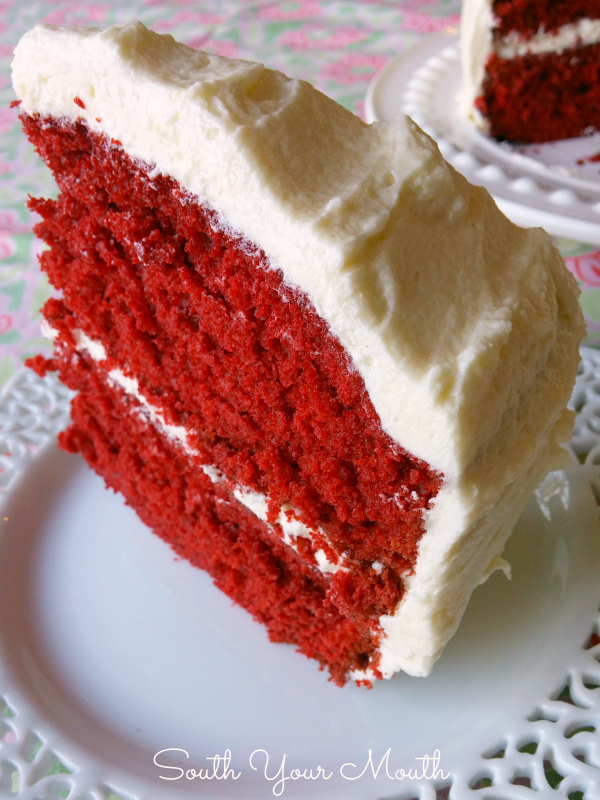 A lot of people associate red velvet cake with cream cheese frosting – and since I never met a cream cheese frosting I didn’t like, that’s A-OK with me – but our old fashioned family recipe for red velvet cake uses what some folks call a ‘cooked frosting’ or ‘boiled icing’. You boil flour and milk together to make the base, let it cool, then mix it with butter and sugar to make a butter cream that will blow your mind! It’s very stable and doesn’t have to be refrigerated (though, you can if you want). It also stands up to humidity and fluctuating temperatures like we’re prone to here in the South. I’ve eaten a lot of red velvet cake in my day but I have to tell you, this recipe is, hands-down, my favorite. The cake is super moist and, well, velvety. And the icing reminds you of something your grandma would have made. 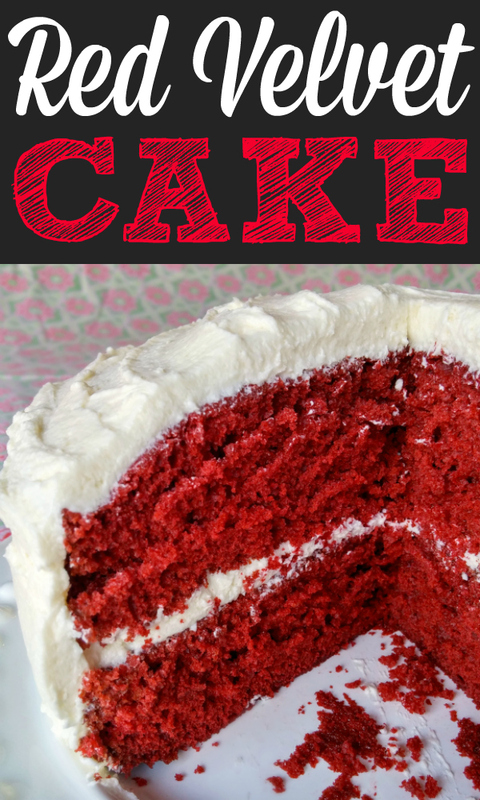 If you’re looking for a true, authentic, Southern red velvet cake recipe, this cake is what you’re looking for! Side note: I wish I'd gotten better pictures. We were running out of daylight and I didn't take the time and care to prep and stage things right to get the best photos. But as you can see here, Angel Baby was a HUGE help! 1 cup butter (real, salted), at room temperature. Cream together butter and sugar with an electric mixer on medium speed until light and fluffy. Add eggs, one at a time, mixing after each addition. Mix cocoa powder and food coloring together in a small bowl to make a paste; add to butter mixture and mix until well combined. Mix salt, vanilla and buttermilk in a small bowl; add to butter mixture alternately with cake flour until well combined. Mix baking soda and vinegar in a small bowl then fold into batter by hand until well combined. Pour batter into 2 9-inch greased and floured cake pans then bake at 350 degrees for 30 minutes or until cooked through. Cool completely then frost with Cooked Buttercream Frosting. Cake does not need to be refrigerated. Add flour to a small saucepan then whisk in milk. Heat over medium-high heat until boiling. Cook and stir until thickened (about the consistency of your cake batter). Remove from heat and cool completely. Cream butter and sugar with an electric mixer until fluffy and smooth (about 3-4 minutes). Add vanilla and cooked flour mixture and continue mixing until creamy, well combined and spreadable. Don’t worry if it doesn’t seem to be coming together – it will. Just keep mixing! You might also enjoy this recipe for BEST Chocolate Cake! Thank you! 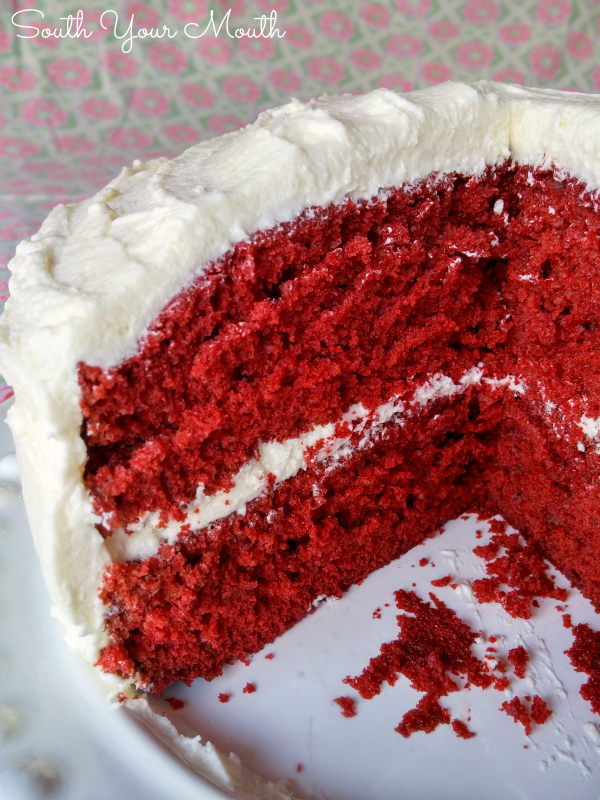 Finally someone blogs about the best frosting for Red Velvet. I do not understand why so many people think Red Velvet goes with cream cheese frosting. We always made this cooked frosting. We call it Ermine Frosting. Any other is just not true Red Velvet. I agree! NO cream cheese frosting on red velvet cake or cupcakes! Well, well....you learn something new everyday. I've never tried this cooked buttercream frosting. I always thought you put cream cheese frosting on red velvet cakes. Will this recipe be enough to cover the entire cake? I have been making Red Velvet cakes for 45 years and this is the first time I have seen the correct recipe for it. The only difference is powdered sugar is used in the icing. The recipe also calls for you to cut each layer with a thread to make 4 layers. We always refrigerated this cake. I have made green and blue velvet cakes also. The icing is awesome on an orange cake. You are absolutely correct! One change I made years ago was the use of Confectioner's Sugar instead of regular, granulated sugar. It mixes in so much more quickly and completely. This frosting is light, fluffy, creamy and is not sickeningly sweet like cream cheese frosting is. I have avoided making Red Velvet because as a kid my friends mom who was from England made the best RV cake ever. I've never had any other I liked. The problem was the frosting! I dislike cream cheese frostings on cake. I decided to try my hand and started looking for different kinds of frostings and found this! This is what I've missed since I was a girl. Thank you for the recipe! My husband is about to be a happy camper. This looks absolutely delightful! I'm really excited to try the frosting recipe. This recipe is a keeper for sure! I'm going to try the frosting first on my husband's chocolate birthday cake! yum! Do you REALLY?! I've never met anyone else who used that name! Love it! Oh my Goodness!!!!!! This sounds so yummy! Can't wait to make it and that frosting is so yummy! Thank you for sharing your Mama's recipe. I've made this cake and icing for 60 yrs , Can't imagine putting cream cheese frosting on it. YES you can use regular flour . I use this icing on all my cakes. Oh my goodness so so yummy. Delicious. 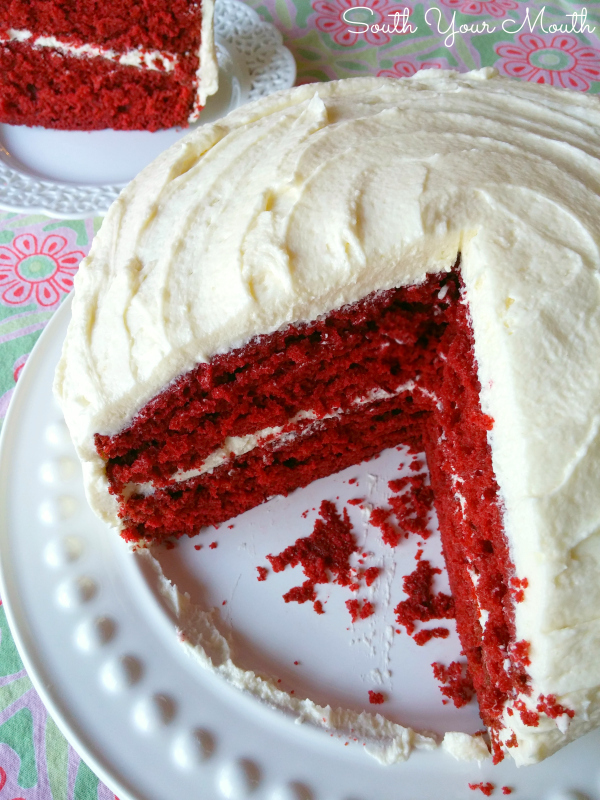 Red Velvet cake is my husband's favorite and this looks better than my recipe. We are having a surprise 65th bday party for him and to check it out I made a sample one for him before I make it for his party. He loved it! He said it was the best I had ever made. So now I have a question. I am making Texas sheet cake for the chocolate lovers and would love to put this on the menu too. Do you think I could make sheet cakes out of this as well? I think it would be fabulous but wanted your opinion. Thanks for all the new ideas. This midwestern cook loves them. Yes, totally! Obviously, you'll have to adjust the cooking time but I'm sure you'll figure it out. I almost always make my cakes in 13x9 pans. It's just so much easier to store and transport that way! And give your husband a BIG FAT KISS for the compliment and tell him Happy Birthday! My husband's favorite cake just got better with your recipe! I'm going to make this for him for Valentine's Day. I'll even try the boiled frosting. I must confess, though, I LOVE cream cheese frosting. Thanks for another great recipe! This is the recipe that my family has made forever. So many family get-togethers and memories. I always feel bad for the people that think cream cheese frosting is the way to go. Once you try the cooked buttercream you will never go back. Hello from Montreal,Canada! Is it necessary to use the whole bottle of food coloring? I was wondering if the batter would still be red if I cut it down to 1-2 Tablespoons? I *think* one ounce is only 2 tablespoons. I could be wrong, but I think that's right. You're certainly welcome to use less - it won't change the flavor! There's always room for Red Velvet Cake. Love it. OH My...I would love to try this recipe! My daughter loves red velvet. We have always used the box mix. I would so love to try homemade. Looks delicious!! Finally, a recipe with the frosting my grandma made for red velvet cake! I always make it this way. I don't know when cream cheese frosting became the go-to. I have always wanted to make a red velvet cake from scratch and icing too.....well, I tried this and it was so easy and delicious!!!!! I can truly say I have not been disappointed with your recipes...thanks for this awesome recipe and the many many others!!! Makes me just want to lick my screen! no cream cheese frosting on my Red Velvet cake. My aunt always made the frosting with all purpose flour and Crisco, not butter. Will have to try your version of the frosting. We call this frosting Mock whipped Cream. It is good but cream cheese is better. I use 8 oz. of cream cheese and 8 oz. salted butter. Alan Jackson has the best red velvet cake recipe ever! This looks scrumptious! However, how could I use red beets in place of the food coloring? I cannot and never would use red food coloring as it is formulated from bugs. Thank you! Red beets would change consistency and flavor. Just leave out the red food coloring. But I bet you already knew that answer, didn't you? This looks like the cake my mom made me every year for my birthday. I haven't had this cake in 12 years. I will have to check my recipe to see if it is the same recipe. Wow am going to make this for Easter yum!! I made this for the first time tonight,followed the recipe closely and..........it was absolutely amazing!!!! Moist,chocolatey loveliness. Thanks for a fab recipe. There is absolutely NOTHING in the world like red velvet and Ermine frosting. I've only ever had it with cream cheese frosting once, and never again! The cream cheese kills the delicate chocolate flavor. Ick! This is the exact recipe my grandma and my mom have used for many years and now my sons all ask for it for all of their birthdays. In fact, I will be making 100 red velvet cupcakes for my son's graduation party this Saturday along with 100 fresh strawberry shortcake cupcakes. Gonna be a busy girl! Hi Mandy! Great name! ;) I just love your blog! 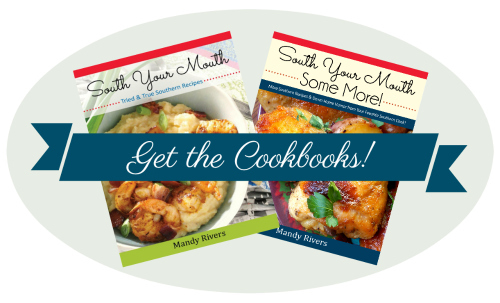 I moved to the lowcountry from TN about 5 years ago and just could not jump on the grits wagon. That is until I tried your shrimp and grits! Wowza! So delicious! I have a question about the butter. Say all I have is unsalted and I wanted to be cheapo peapo and not buy any more, how much salt would you recommend adding to the icing to make up for the missing salt in the butter? OH, I forgot to mention...my Grandma sometimes used Vanilla, Butter and Nut extract instead of vanilla. It does tint the frosting a bit but it gives the frosting a yummy spin on plain ol' vanilla. But I am NOT knocking it. This frosting ROCKS and everyone in our family loves it. 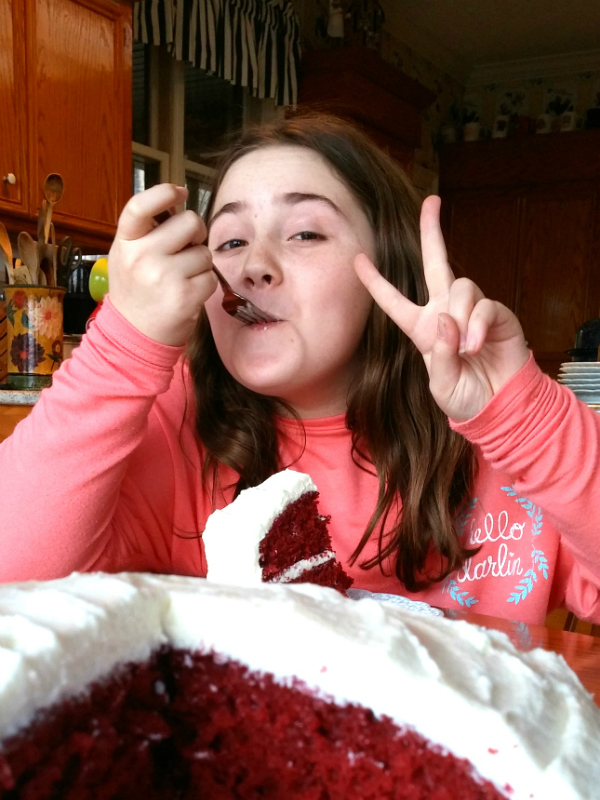 Cream cheese is good for a lot of things, but it destroys a good Red Velvet Cake. Ermine frosting all the way!! There is no other viable RV frosting in the world. The icing is amazing! Had to make a double batch to cover the cake properly. Definitely a keeper recipe. Judging from the comments, I must the the only one who screwed this one up. I had this planned for my Thanksgiving dessert (I'm not a pie fan). I made it today, the day before and it was just awful. The actual cake was only very faintly red and it had an artificial taste. The icing was the real loser though. The flour/milk cooled to a gelatinous mess. When I added it to the sugar/butter and vanilla, it mixed but would never break up all the way, leaving small clumps with a gummy mouthfeel. The whole thing together left a really awful aftertaste. Luckily, my local bakery has fantastic cakes because after this disaster, I didn't have the heart to try again with a different recipe. Ug. What a beautiful cake! And I love cooked buttercream frosting. I haven't made it in a while, I need to change that! I happened upon this recipe and love that the icing isnt cream cheese. I always thought the cream cheese icing was just too sweet for this cake. Havent tried it yet but hopefully soon. I will let you know how it turned out. Thanks for sharing. I almost cried when I made this cake. I finally got it right. This recipe is absolutely perfect. Thank you Mandy!